Sift the flour and bi-carbonate soda into a bowl. Add the salt. Make a well in the centre and pour in the oil, and then the lightly beaten eggs. Gently mix together until the flour comes together. Gradually mix in the almond milk a little at a time, until the mixture resembles the consistency of thickened cream. Cook the pancakes for 1– 2 minutes each side in a moderately heated pan with a small drizzle of coconut oil. Keep the pan warm and add the sliced mango with a little more oil. Add 2 tablespoons of the maple syrup, then cook the mango for approx. 30 seconds each side. Just enough time to make juicy, syrupy, saucy mango. 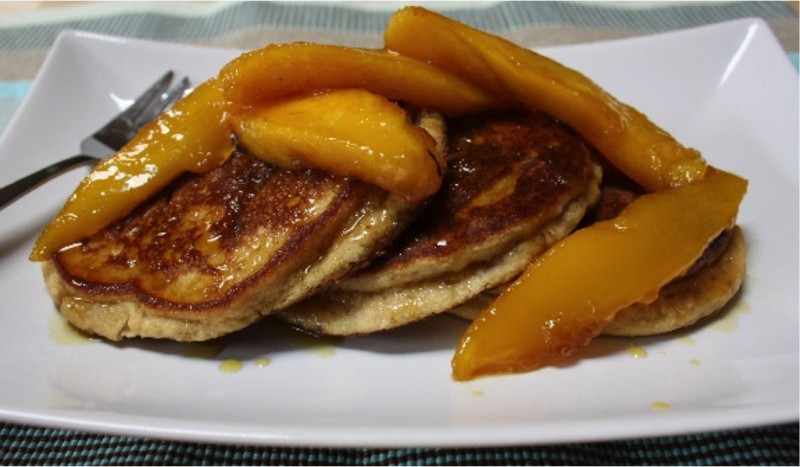 Serve the pancakes with the mango strips and a little extra maple over the top if desired, although extra syrup is not at all necessary.